A Day In The Lyceum: A New Library Card! Dramatic History: Enjoy the Golden Age!! Today I made a little impromptu visit to my new local library. I recently moved and I hadn't yet visited. Well, today I had some free time and I needed to visit the town hall. After paying my excise tax and updating my voter registration that taking a whole five minutes I found that I had some extra time. So I walked across the building to the library. Yes, the town hall and the library share the same building. How convenient is that? Well, I am going to save my review of the East Longmeadow Public Library for another blog. (Soon, I promise. I do want to say however that I enjoyed my visit very much.) What I did do there was something that I really needed to do. I updated my library card. My last card was so faded and beaten the poor thing. Plus, last Fall I realized (on a very stressful day I might add) that the number of my card did not match the number in the computer. So as I was trying to use the network printer the number I was using to log in was not matching the number to check out a book. My twenty print requests sitting in a buffer limbo for an account that doesn't exist - never executed. A sad end. It was a matter of some misplaced zeroes. It was a bad day. Well, it has been retired. So now I have a spiffy new card brimming with future possibilities. The procedure was a snap. Three tasks off my list in ten minutes - a good day. When I got home I decided to look through my old library cards and took a little group photo. I am fairly positive that I found the ones that I have. I thought that I had my first from Easthampton, but that doesn't appear to be the case. 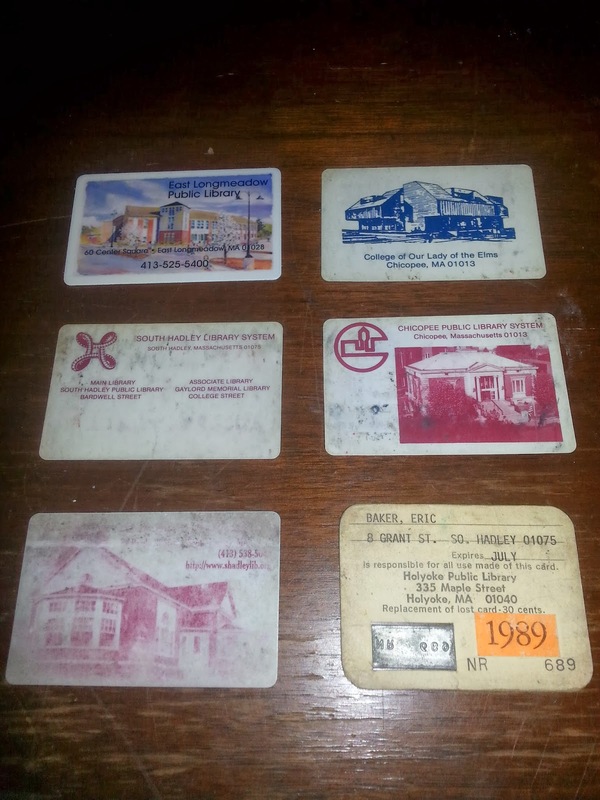 I do know that I had an earlier Holyoke card when I first went to school after my Mother and I moved to Holyoke and would have had a nice big 1983 on it. I also thought that I had one from Springfield, but after some thought that was not the case. I used my Holyoke card at Springfield before all the libraries linked up online then I used my Chicopee card afterwards. So many great memories with all of them. A library card is as necessary as a driver's license. I very much agree! Even if one doesn't use their library card as often as they could it is still a statement that one supports this most estimable of public institutions.